Now that we’ve covered most of the structural elements of Mid Century Modern Design, it’s time to shed light on accessories that make a statement. In the Danish Modern school, lighting was nearly exclusively the domain of wooden-based desk, floor and table lamps, sconces and chandeliers. As the movement developed in Western Europe and the United States, plastic, metal, Lucite and Nylon began to emerge, as well as a wide range of shapes, colors and themes. One of the best-known designs was the ‘Sputnik Chandelier’, modeled after the Russian spacecraft that first orbited Earth. Not surprisingly, many of the prominent names in the Mid Century Modern aesthetic contributed lighting designs. Luminaries such as Eames, Saarinen, Wegner, Nelson, Jacobsen and Noguchi designed lighting elements. Also contributing were newcomers Bertoia, Panton and Schepp. Care must be taken while shipping these items, especially those that are true vintage, as they can be very delicate to handle. Inspecting electrical elements is also important once Mid Century Modern lighting is delivered. Click here to list Mid Century Modern lighting for delivery. 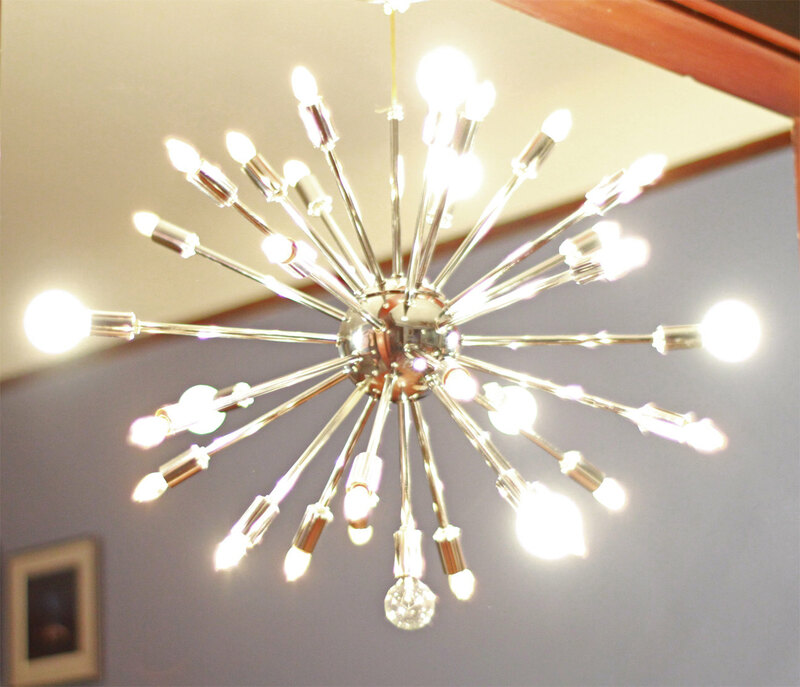 The Sputnik Chandelier is a staple of Mid Century Modern design. This entry was posted in 24/7 shipping, furniture shipping, Household Items and tagged mid century modern lighting, retro, retro lighting, ship lighting online, ship mid century modern, ship mid century modern online, space cowboy, sputnik. Bookmark the permalink.